TGS is pleased to announce Jaan, a fully harmonized 3D multi-client project in the southern portion of the MSGBC Basin from northern Senegal, through The Gambia and the AGC zone, into Guinea-Bissau down to the Guinea transform fault. This project will consist of 11,135 km² of new acquisition complemented by the reprocessing and full pre-stack merging of existing multi-client 3D. The new data will be acquired using modern triple source broadband acquisition. Once complete, the final depth migrated volume will be over 28,300 km² and will completely capture the prospective paleo-shelf edge trend from the shallow to the deep. This investment is being undertaken by TGS as operator and majority investor together with PGS and GeoPartners. Data will be acquired using the BGP Prospector seismic vessel and acquisition will commence early Q4 2018. Data processing will be performed by TGS using its Clari-Fi™ broadband technology. “The Jaan project will further cement TGS’ position as the leading provider of seismic data in this rapidly emerging basin. 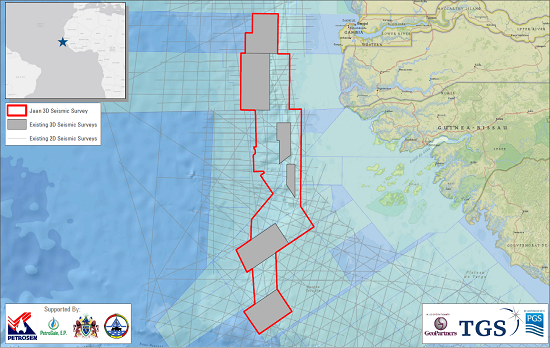 This further expansion in the MSGBC basin confirms TGS’ continued commitment to the Northwest Africa Atlantic Margin data, where TGS already has over 50,000 km of 2D data and over 17,000 km² of 3D data,” commented Kristian Johansen, CEO, TGS. This survey is supported by industry funding. TGS provides multi-client geoscience data to oil and gas Exploration and Production companies worldwide. In addition to extensive global geophysical and geological data libraries that include multi-client seismic data, magnetic and gravity data, digital well logs, production data and directional surveys, TGS also offers advanced processing and imaging services, interpretation products, and data integration solutions..